As of late (the past week), I’ve become enthralled with the idea of simple syrup. It’s basically nothing but a combination of sugar and water, heated until the sugar dissolves in the water and then cooled. I talked a little about making the Sazerac in my last mish-mosh of a post, but ever since the original batch, I’ve been getting curious, and today, I’ve started making a few more. The biggest danger with the simple syrup is how much flavor it adds to anything – just a little sugar and flavor make anything better. When you pull the syrup off of the heat, you can throw basically anything into it, and the syrup will absorb the flavor. I’ve played with mint and lemon so far, but I have ideas about basil, orange, and maybe something crazier like ginger or green tea. On the advice of this comment from Ask MetaFilter, I tried making a little lemonade using my lemon simple syrup, lemon juice, and water. Let me tell you – after years of grainy, gritty lemonade, this was like a punch in the face from summer. I’m not sure that I could go back to the old stuff, adorable 5-year-olds on the side of the road be damned. The simple syrup seems to be the lynch pin in a lot of delicious beverages, alcoholic and otherwise. I combined a shot of the lemon syrup with vodka and club soda later in the evening to make probably one of the best summer spritzers I’ve ever had. Definitely beats the pants off of most bad white sangria I’ve had: not too sweet, not too alcohol-y, just right. Lovely Wife, after tasting the mint simple syrup, decided that she needed to try it in a paired down mint julep. Bourbon, mint syrup, and a splash of club soda makes a delicious drink. I’m also thinking of combining it with either fresh iced tea (or sweet tea vodka) to make a delicious drink. Simple syrup, if you’re curious, is also the basis of a lot of other cocktails (Old Fashioned, Mojito, etc. ), and you can even use it to make your own sour mix. I mean, it’s the chameleon of the bar, and it’s tasty. Outside of drinks? If you’re trying to decorate cakes, you can brush the tops with simple syrup to keep them moist after you add the frosting. The whole thing has also brought out of my other favorite thing – trips to the restaurant supply store. I’ll elaborate on this in a future post, but lets just say that if my favorite grocery store is the happiest place on Earth, Disney World, my favorite restaurant supply store is like EPCOT. It’s nearby, not quite as fun, but has its merits and has more fun gadgets to play with. The most recent trip, though, involved squeeze bottles. I’m going to be making tons of simple syrups, right? But buying in bulk is better, right? I probably didn’t need 6, but that’s what I ended up with. Oh well – that means I have 4 extra bottles with which to experiment. I probably didn’t need two extra measuring jiggers, 6 cutting boards, and a strainer, but hey, I got that as well. Sure, it’s just sugar water, but this is the first time I’ve ever played with it, so I’m allowed a little child-like wonder. Now that I have a proper bar with bottles of rye, absinthe, and bourbon, simple syrup expands my mixed drink options, as well as giving me the little sugar rush that one needs in life. 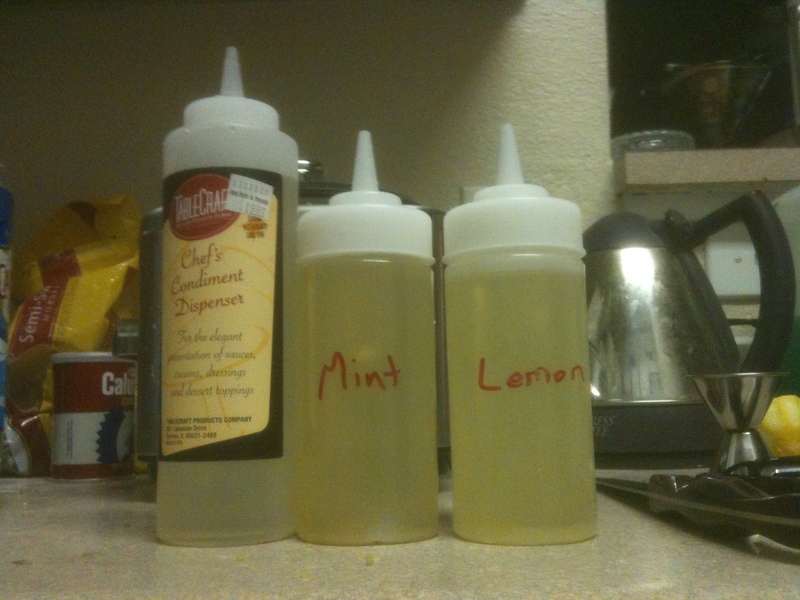 This entry was posted in Food, Stuff I Love and tagged cooking, lemon, mint, sazerac, simple syrup, sugar. Bookmark the permalink. All of the inane rambling here are belong to me. If you want to use them somewhere else, consult your doctor to make sure you aren't ill, then ask me.